It's almost scary that the team with the most talent waiting in the wings, is a franchise that has proved to be very formidable as currently constructed. Phoenix clearly values hockey bloodlines, witnessed by the selections of Viktor Tikhonov, listed below, the namesake of his legendary grandfather; a fourth generation Hextall, Brett; yet another Staal brother, Jared; and Vladimir Ruzicka, who's father of the same name, was a Stanley Cup and Olympic Gold Medal winner. Add the aforementioned, the top prospects listed below, to a well balanced group of 20-somethings, including Keith Yandle, Petteri Nokelainen, Martin Hanzal, Wojtek Wolski, and superstar goaltender Ilya Bryzgalov, not to mention a great veteran core (Doan, Jovo, etc...), and this team has an exciting future ahead of it. 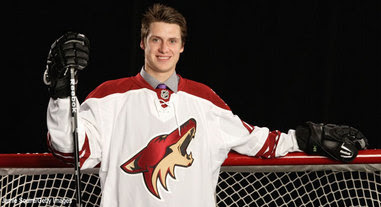 Oliver Ekman-Larsson, D - #6 overall 2009 Draft. By all accounts Larsson is an elite puck mover and skater with a great overall skill set. Kyle Turris, C - #3 overall 2007 Draft. Turris has had a fine season in San Antonio scoring more than twenty goals and gaining valuable professional seasoning and adding some grit to his game. Mikkel Boedker, RW- #8 overall 2008 Draft. Another swift skating, skilled forward. He has earned call ups to the Coyotes on a number of occasions this season. Maxim Goncharov, D - #123 overall 2007 Draft. Highly valued, skilled, puck mover, who plays bigger than his size might indicate. Viktor Tikhonov, C/RW - #28 overall 2008 Draft. Aggressive forward with a big frame and good hands. Struggle a bit in North America, but exploded after being loaned to KHL. Brett MacLean, LW - #32 overall 2007 Draft. Good size and gifted goal scorer. Led OHL in goals his last season in Oshawa, AHL All-Star in his first pro season and keeps improving. As recently as this pre-season, the Coyotes franchise seemed doomed in every possible way. Now, just seven months later, Phoenix is promoting playoff ticket packages, and their famed, albeit borrowed, playoff "whiteout." Regardless of the future location of the team: Phoenix, Winnipeg, Kansas City or a second team in Atlanta (kidding), the on-ice product should be excellent for many years to come! Yeah this is kinda nuts to think about. I see them and the Kings having the best combination of current success and awesome future potential.